Capricorn Research would not presume to understand Quantum Theory but it does show that on a subatomic level things are certainly not what they seem. In fact things can be in more than one place at the same time, and other things that we have always thought were different and separate from each other are in fact not. If this behaviour continued above the subatomic level, it would be very difficult to distinguish between one collection of atoms and another because they would be constantly moving and changing shape. People would be able to walk through walls, buildings and even each other without any problem at all. In fact people and anything else for that matter as separate entities could not really exist. A natural extension of Quantum Theory would say that we don’t exist, we only appear to because our brains tell us we do. There always seemed to be an appropriate neatness in that the smallest phenomenon is so similar to the largest. Within an atom, electrons spin in orbits round the nucleus in the same way the planets spin round a Sun. Quantum Physicists have found one important difference, however. If an atom is heated these electrons could jump from one orbit to another without moving through the space in between therefore making a quantum leap. This would be tantamount to Mars instantaneously appearing in the orbit of Saturn and we all know what kind of problems that could cause. So an electron could be in one place or another but nowhere in between. If this was translated above the atomic level anyone could suddenly disappear and appear somewhere else. It would mean that we could be at home and then at work instantly saving all that horrible commuting. The phrase ” Beam me up Scotty ” comes to mind. Classical physics at the time as represented by Einstein believed that science could predict things with certainty. Quantum mechanics blows that idea out of the water. The original quantum physicists in the 1920s and 30s were truly radical people, the discoveries blew apart our conception of reality. Quantum mechanics was a science of Jupiter like adventure and discovery which expanded our thinking to a different plane altogether but also of Uranus, the rebellious planet of chaos and unpredictability and of breaking down the boundaries of convention. So its interesting to note that the chart of one of the most famous quantum physicists, Max Born was utterly dominated by these two planets. Max Born had a stellium or multiple conjunction in Jupiter’s sign, Sagittarius. Sagittarius is the sign of the visionary, the explorer. Sagittarian journeys can be either of the body or of the mind, but the one thing they all have is a tendency to fire their arrows far and wide in a powerful search for knowledge and understanding. They have a broadminded approach to life, always interested in the big picture and have a strong desire to be free to explore wherever they wish to go. They are enthusiastic, and direct in their communications with others. They are frequently outspoken and will tell people what they think even if this upsets others. They can be tactless and blunt but their reasoning is that its important to be honest. Born had the Sun, Mars, Mercury and Venus in the 10th house so it was inevitable that his career would take him to boldly go where no man had gone before. The Sun and Mars are in exact conjunction showing him to be a real pioneer. As if this wasn’t enough his Sun, Moon and Mars conjunction is part of a T Square in opposition to Jupiter. This opposition points to an extremely powerful apex Uranus showing that Born was a real revolutionary in scientific thinking. So all that exploratory, pioneering Sagittarius / Jupiter energy is thrust onto Uranus. Uranus is independent, rebellious,inventive and provocative. It seeks to liberate us from our narrow, conditioned and conventional ways of seeing things. It can be uncomfortable and disruptive. If any planet was to take away the certainties of existence it would be Uranus, its far more likely to see the Universe as chaotic and disordered than any other planet. Born’s Uranus is made even more powerful given that it is his planetary ruler due to his Aquarius Ascendant. The turning point of Born’s life came between 1901 and 1905 when Pluto was opposite his Sun. He began University in 1901 but moved to the University of Göttingen in 1904, where he found the three renowned mathematicians, Felix Klein, David Hilbert and Hermann Minkowski. Very soon after his arrival, Born formed close ties to the latter two men. From the first class he took, Hilbert identified Born as having exceptional abilities. In 1905, Albert Einstein published his paper ‘ On the Electrodynamics of Moving Bodies ‘ about special relativity. Born was intrigued, and began researching the subject with Minkowski, and subsequently wrote his habilitation thesis on the Thomson model of the atom. Quantum experiments showed that electrons would under certain conditions behave like waves rather than particles with the possibility of splitting and combining. This is another staggering discovery, until this point waves had been waves and particles had been particles, distinctly different things. Another important contribution was made by Erwin Schrödinger, who looked at the problem using wave mechanics. Schrodinger thought that an electron could get spread out to become like a wave. This had a great deal of appeal to many at the time, as it offered the possibility of returning to deterministic classical physics. In true Jupiter / Uranian style, Born would have none of this, as it ran counter to facts determined by experiment. Born’s truly radical discovery said that the wave was not a spread out electron but a probability wave. He said the size of the wave at any location predicts the likelihood of the electron being found there. So the electron has many possibilities in terms of being at any place on the wave. He formulated the now-standard interpretation of the probability density function in the Schrödinger equation, and the probability thus calculated is sometimes called the “Born probability”. Born published his findings in July 1926 when Uranus was exactly opposite its natal position, recreating its relationship with the Sun, Moon, Mars and Jupiter. From an astrological perspective this would be the time in his life when he was at his most inventive, provocative and disruptive. So Born found that we can’t predict where an electron is but Schrodinger’s equation can predict the likelihood of it being in any one place at one time compared to another. So all the rules of the Universe which is made up of atoms are governed by probability not certainty. This famous quote that has been popularised as ‘ God doesn’t play dice ‘ brought a response from quantum physicist Niels Bohr ‘ Stop telling God what to do ‘. Born’s discoveries have been the source of philosophical difficulties in the interpretations of quantum mechanics, topics that continue to be debated even today. According to Quantum Mechanics the decision to measure the position of an electron will itself influence that position. When it is observed in a particular place the observation itself forces the electron to relinquish all of the other places that it could have been in at that moment. The act of measurement forces the electron to make a choice. So things only exist in any one place because we observe them to be there. Einstein wasn’t keen on this – he said ‘ I like to think that the Moon is there even when I’m not looking at it. ‘ Einstein believed that Quantum Mechanics was not incorrect but incomplete. To extend this concept to our own level of reality would suggest that nothing is definitely in any one space at any time. Other people are not really where they appear to be, its only our observation that makes them so. Capricorn Research is tempted to test this theory with an experiment to kick a quantum physicist up the backside whilst not looking at him. There is no reason that it should hurt as in all probability he is not there anyway. Another extraordinary discovery is the Quantum Concept of Entanglement – if two electrons come close enough together they absorb something of the nature of each other and they will continue to display this connection even if they go their separate ways over vast distances. So if you chose to measure one of these electrons establishing its position, you would also affect its partner no matter how far away it was. Recent experiments have verified that this works even when the measurements are performed 10,000 times more quickly than light could travel between them. According to quantum theory, the effect of measurement happens instantly. These electrons can be zillions of miles away from each other and there’s no possibility of any forces or pulls operating between them and no way they can communicate with each other. Of course Scientists are perfectly capable of getting their brains round this stuff when doing their own work, but not it seems when they come to dismiss the science of Astrology. A common objection is how can the planets affect individuals on earth, any gravitational or magnetic pull from even the Moon on an person would be less than that exerted by a double decker bus on the other side of the road. Astrology doesn’t work like that, it works on the basis of symbolic entanglement. If entanglement can work between two electrons that come together in space, the same principle can surely work between phenomena that come together in time. As physicists are always telling us space and time are fundamentally the same thing. So if someone is born at a moment in time, the moment is the thing that brings everything in that moment together. So the positions of the planets become entangled with that individual and the relationship continues through time and space. The behaviour of that individual can be understood and even predicted by observing the entangled partner, in this case the position and behaviour of the planets. Scientists will often dismiss Astrology as being stuck in the Middle Ages, but in fact its very way of working shows it to be a Quantum discipline. As a quantum physicist Max Born might have thought the Universe unpredictable but because he had an apex Uranus Astrology would have predicted that he would think that. Pluto’s first transit to Born’s T Square predicted his first exposure to the subject of Relativity and set him on his journey. Uranus’s transit to the same pattern predicted his probability density function for which he eventually won the Nobel prize for Physics . Pluto’s second transit to his T Square actually predicted his death in 1970. 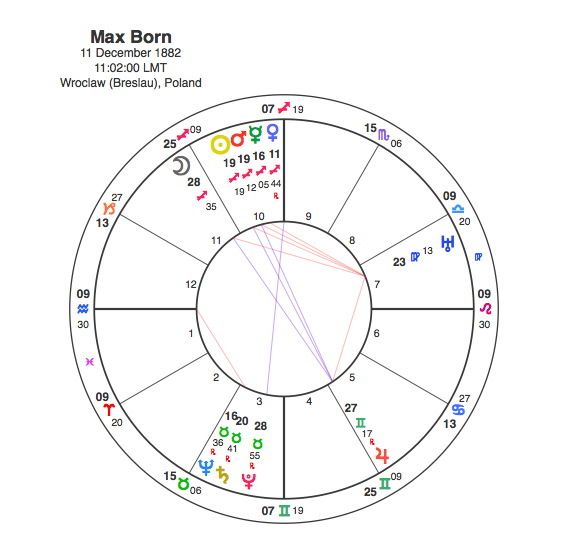 Max Born was literally born to destroy the certainties of science but Astrology can prove that the Universe is not as unpredictable as he thought.